Japanese researchers introduced an interesting concept: cut-and-paste tactile sensors. The figure below illustrates the concept (I think they tried to depict an robot arm, but failed). The term “cut-and-paste tactile sensors” refers to the installation of the sheets by literally cutting and pasting them on a surface. 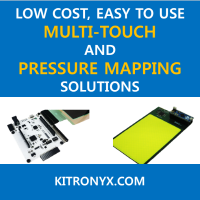 Moreover, because these sheets are flexible enough to be folded and cut, it is possible to select the location of each tactile sensor element rather freely. An important merit is that only one type of tactile sensor sheet is required for covering a whole system. As shown in the above figure, installation of the tactile sensors is quite simple. Just connect sensor modules and put them on any curved surface. Link: Y. Ohmura, Y. Kuniyoshi, and A. Nagakubo, "Conformable and Scalable Tactile Sensor Skin for Curved Surfaces," in Proc. the 2006 IEEE Int. Conf. Robotics and Automation, pp. 1348-1353, Orlando, Florida, May 2006.